MyDay daily disposable. Delivers on everything. Compromises on nothing. High water content and a naturally wettable surface without a coating or internal wetting agent. CooperVision's MyDay daily disposable contact lenses feature a unique chemical structure that shapes silicone into a network of channels that are much more efficient at delivering oxygen through the lens. So less raw silicone is needed for optimal oxygen permeability. This leaves more room for hydrophilic material, creating a lens with the best of both the hydrogel and silicone hydrogel worlds. To help you satisfy more of your patients, we’re happy to offer a wide range of practice support material to help drive more sales to your business by promoting MyDay lenses. Please contact your CooperVision Business Development Manager for more information. MyDay daily disposables have undergone rigorous clinical studies to help you offer a lens that will fit effortlessly into your patient’s day. The results speak for themselves. 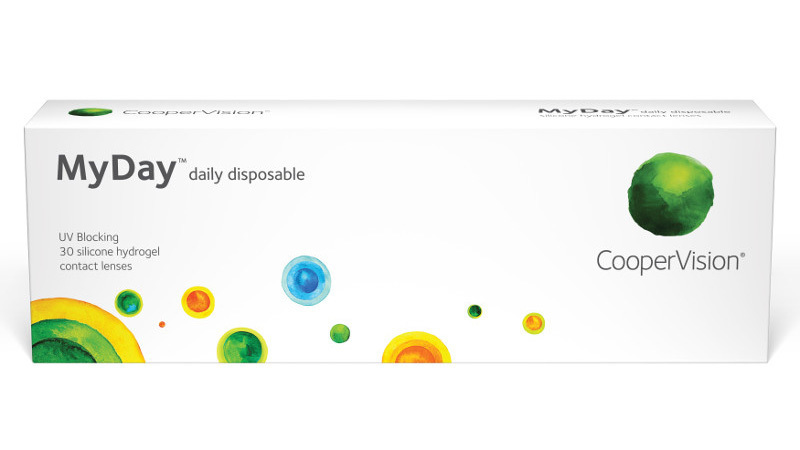 MyDay daily disposable contact lenses meet the needs of today’s demanding wearer.